Lindsey Dillon, of the University of California, Berkeley, has just published “Race, Waste, and Space: Brownfield Redevelopment and Environmental Justice at the Hunters Point Shipyard” in the latest Antipode. Abstract:This paper advances the concept of “waste formations” as a way of thinking together processes of race, space, and waste in brownfield redevelopment projects. Defined as formerly industrial and contaminated properties, in the 1990s brownfields emerged as the grounds for new forms of urbanization and an emerging environmental remediation industry. Through their redevelopment, the twentieth century’s urban wastelands—environmentally degraded, economically divested, and often racially marked—have become sites of investment, resignification, and value formation. The concept of waste formations provides a critical framework on the ways these socio-ecological transformations rework twentieth century urban inequalities—in particular, the articulation of waste and toxic waste—and the ways they produce new geographies of environmental injustice through the displacement of toxic waste to newly waste-able spaces. 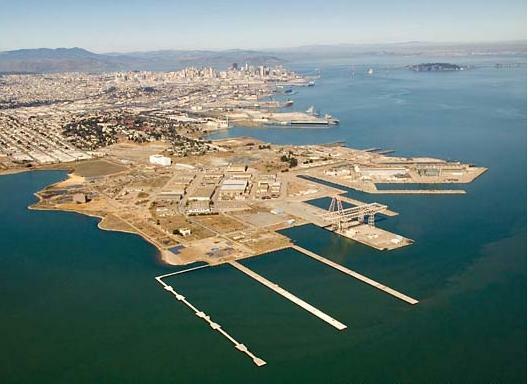 This paper develops an analytic of waste formations and applies it to the process of brownfield redevelopment at the Hunters Point Shipyard in southeast San Francisco. transformations (Heynen, Kaika and Swyngedouw 2006). In particular, emphasizing the social relations of waste and wasting challenges simple narratives of progress through which the reintegration of formerly industrial lands into commercial and residential real estate markets—such as the Hunters Point Shipyard project— take place. The redevelopment of brownfields—which are defined as formerly industrial sites in which contamination prevents or limits future development— emerged in the 1990s as a widespread urban economic growth strategy and is usually narrated as a process of urban revitalization and ecological restoration (Bjelland 2004; De Sousa 2008; Hula and Bromley-Trujillo 2010). mountains” (quoted in Bauman 2004:2). The constant removal of what gets categorized as “waste” maintains the elevated status of social life in Calvino’s city, and yet those same waste removal practices also render that life unstable, threatened “on every side”. This allegory captures the ways in which waste, at least within capitalist societies, is a category formed always in relation to value. Moreover, it highlights the ways capital’s constant “revolutions in value” are premised on the continuous removal of waste objects, and yet this removal is better understood as a displacement. Waste remains, though it may be confronted and lived by beings in different times and places. This entry was posted in Difference: Class, Race, Gender, Environment, Justice (EJ), Urban and tagged geography, Hunters Point Shipyard, military, Navy, race, space, waste, waste formations. Bookmark the permalink.